I started the Great Reads section of Beyond Here two years ago, with the intention of building a library of resources about the business of photography. The early posts featured books that I read and recommended, and which were available via Amazon. A good example is this post about a book titled Taking Stock by Rob Sylvan. With today’s post I’m expanding the Great Reads section of Beyond Here to include online resources as well. Here is Great Reads – Backyard Silver. Backyard Silver is a blog written by US based stock photographer Steve Heap. Steve and I recently discovered each others blogs, and while we live on opposite sides of the world, we had many things in common. We are both stock photographers. We both started in microstock at about the same time, and we both stuck at it. We both have thousands of images available via microstock libraries, and both count income from microstock as a key portion of our photography businesses. The one significant area we differ is that I chose (in 2010) to become exclusive with iStock (and still am) while Steve chose to be an independent stock photographer. By independent, I mean that he submits his images to a wide range of microstock sites. And this key difference is why I encourage Beyond Here reader’s to check out Backyard Silver. Specifically Steve covers two areas which I am often asked about – the first is feedback about different stock sites, and the second is exactly how much money it is possible to make. Steve outlines each of the sites he contributes to, how many images he has with each site, and the monthly income he generates. Here is an example of a post which gives this detail. As an exclusive photographer with iStock I like the simplicity of uploading, tracking, and payments which come from dealing with just one agency. I recently asked Steve how he handles the workload of submitting to multiple sites, and he kindly wrote this post outlining how he does it and which tools he uses. 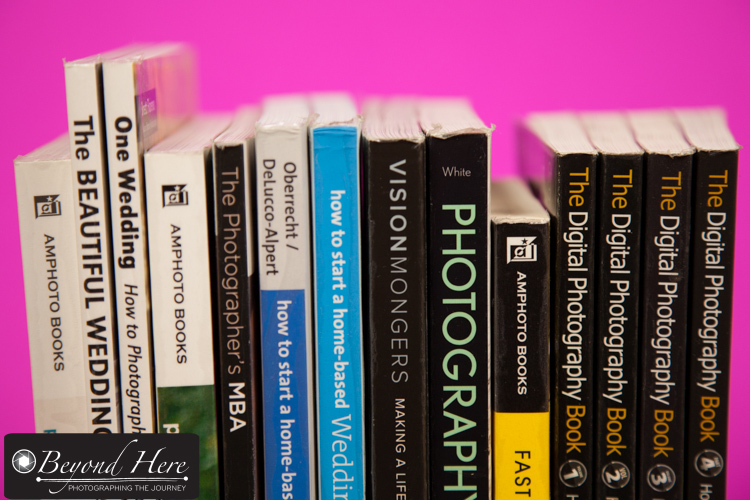 If you are interested in the world of stock photography, I recommend you check out Steve’s blog. Thanks for reading Great Reads – Backyard Silver. This entry was posted in Great Reads, Stock Photography and tagged Backyard Silver, ebook, ebooks, great reads, Steve Heap on October 30, 2016 by Craig Dingle. In Melbourne, Australia it is spring (though today sure doesn’t feel like it!) It is a time when our weather starts to warm up and we move into daylight savings. This year over spring and summer I am adding to the stock photo series I started last year focusing on Melbourne lifestyle images. This is in response to a brief from Getty Images, which encourages photographers to shoot authentic images on location. This post covers my most recent shoot and is all about shooting lifestyle stock images. 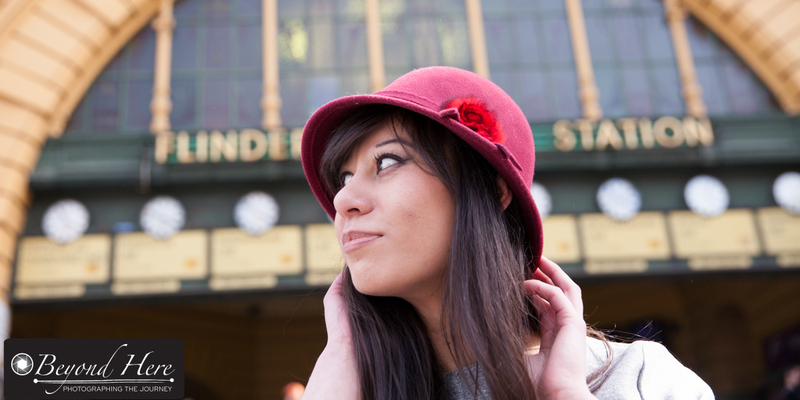 We started this shoot at Flinders Street Station, in instantly recognizable Melbourne location. Planning. Melbourne is a vibrant and cosmopolitan city down here at the bottom of the world. I have been building a portfolio of lifestyle images like the ones displayed in this post. One of Melbourne’s distinctive features are the cafes and restaurants in the laneways of the inner city. They are part of what sets Melbourne apart from other Australian cities and these were the primary locations I used on my latest shoot. Shooting lifestyle stock images is a lot of fun, and having a plan of what and where you are going to shoot is an important first step. Finding the right model. To find models for this series of shoots, I placed a casting call on Model Mayhem as I outlined in this earlier post. So far I have had 10 models express interest in this type of shoot giving me a reasonable selection. For this shoot, I worked with Julia. We exchanged messages on Model Mayhem followed by speaking on the phone about the shoot. I generally try to meet the model before the shoot so that we can talk through the details, but on this occasion it wasn’t possible and we made do with a phone conversation. Hair, Makeup, Wardrobe. When I’m shooting lifestyle stock images I generally ask the model to look after their own hair, makeup and wardrobe rather than having a hair and makeup artist and stylist involved. This keeps production costs down and generally the model is comfortable doing their own hair and make up and wearing their own clothes. I am aiming to shoot authentic and realistic images, and being comfortable with their clothes and look helps the model to relax and be authentic. Logistics. 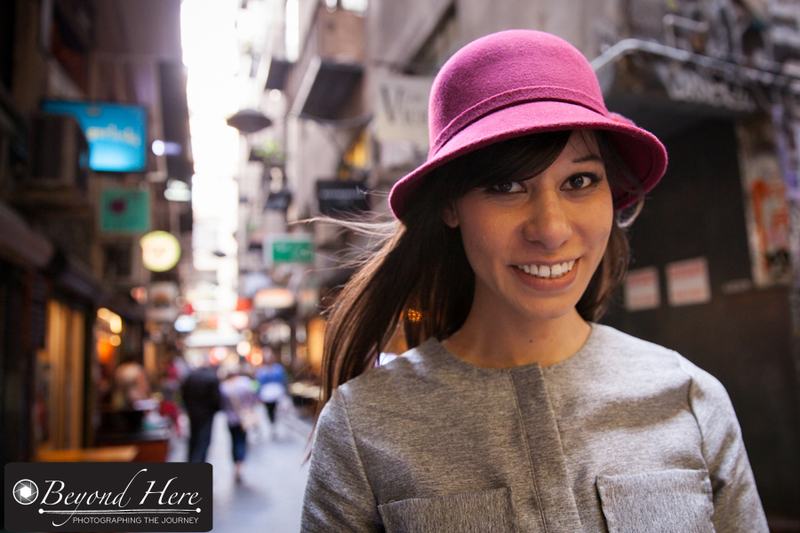 For this shoot we organised to meet at Flinders Street Station in the city. Before we started shooting we had a coffee in Federation Square which gave us time to discuss the shoot and to sort out model releases, invoice and payment. The shoot was then conducted over 2 hours. During this time we started shooting at the front of Flinders Street Station and then walked to Degraves Street, Southbank, Southwharf, Webb Bridge, and we finished by the NAB Building at Docklands. 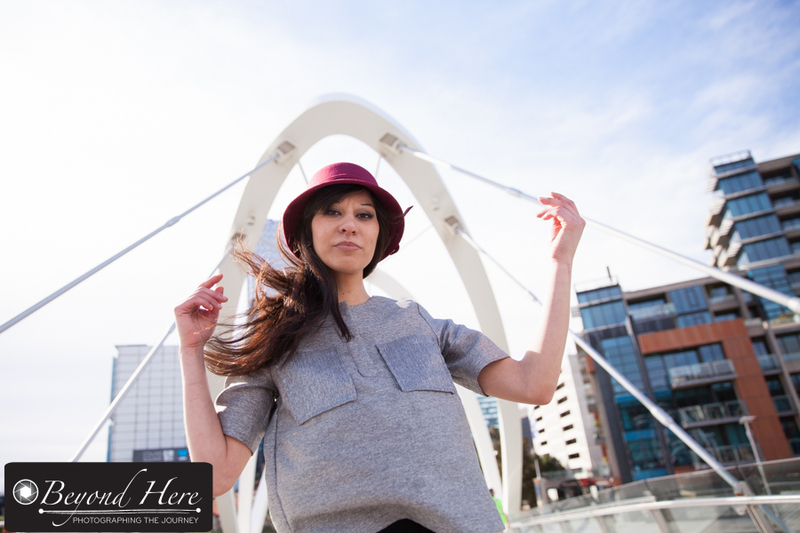 It was a relaxed and easy shoot where we enjoyed Melbourne city and produced a range of useful Melbourne lifestyle images. Post Production. When I’m shooting stock images I put time and effort into planning the shoot and composing shots. I also try to keep post production time to a minimum. This usually involves importing the RAW files into Lightroom and making minor adjustments to white balance, cropping, brightness, color, and highlights. This typically takes a few minutes per file. (The most time consuming part of this process is selecting which files I am going to use and which I will delete. The actual editing of each image is a quick process). Uploading and keywording. The shoot is not complete until the files have been uploaded to the stock photography site and keyworded. I generally do this in the evenings over several days. As an exclusive photographer with iStock for several years I have the process relatively streamlined and spend just a few minutes keywording each image. Where I am uploading a series, I copy and paste the keywords to reduce time and then make minor adjustments to keywords for each file. Expectations. There is strong demand for authentic images which feature real locations (it’s one of the reasons I enjoy shooting lifestyle stock images). In the case of Melbourne, the city has a population of approximately 4 million people and features several national and world sporting events like the Australian Open Tennis, the Australian Grand Prix, the AFL, NRL, and A League soccer games. At present, there is also fairly limited competition for this style of image. For those reasons I expect sales to be strong, particularly around the time of the major sporting events. Thanks for reading this post – Shooting Lifestyle Stock Images – I hope it helps your own stock photography. This entry was posted in Stock Photography and tagged iStock, iStockphoto, microstock, microstock photography, stock photography on October 22, 2016 by Craig Dingle. Shooting useful stock images doesn’t need to be a complicated process or involve high production values. This weekend I’ve had my photography plans disrupted by bad weather in Melbourne, and so I did an opportunistic stock photo shoot on Saturday afternoon. This post is to show you how to shoot simple stock photos using everyday items. The subject. The subject of this shoot was part of our weekly grocery shopping! My wife had bought a large packet of lamingtons. According to wikipedia “A lamington is an Australian cake, made from squares of sponge cake coated in an outer layer of chocolate sauce and rolled in desiccated coconut.” If you live in Australia, I’m sure you know them. If you don’t, it’s worth coming to visit Australia just to try them! They are fantastic. Why would these have value as a stock photo? 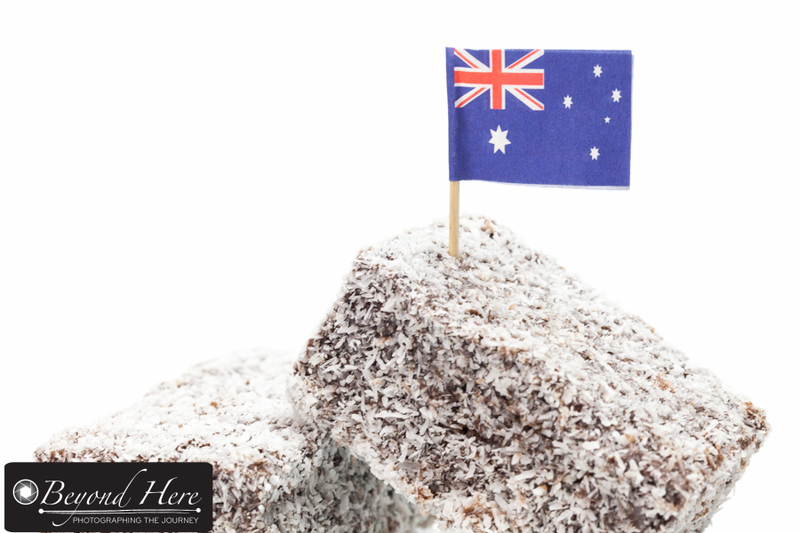 The lamington is traditionally Australian. That makes them a good subject and I expect sales of these images to peak around Australian public holidays – particularly Australia Day near the end of January. To add to the “Australian-ness” I added several Australian flags to the image. Again, this is to enhance the appeal of the images around Australia Day and to tie the image directly to Australia. 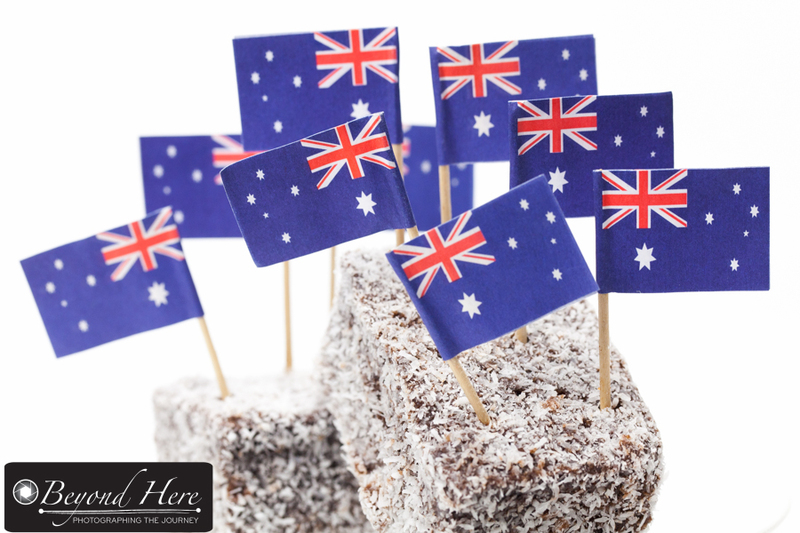 I have gathered a lot of stock photography props over the years, including these little Australian flags on a toothpick. If you want to buy some – look for them at two dollar shops or general merchandise stores. A packet of fifty will cost around three Australian dollars. The flag adds to the Australian theme. Lighting and Background. 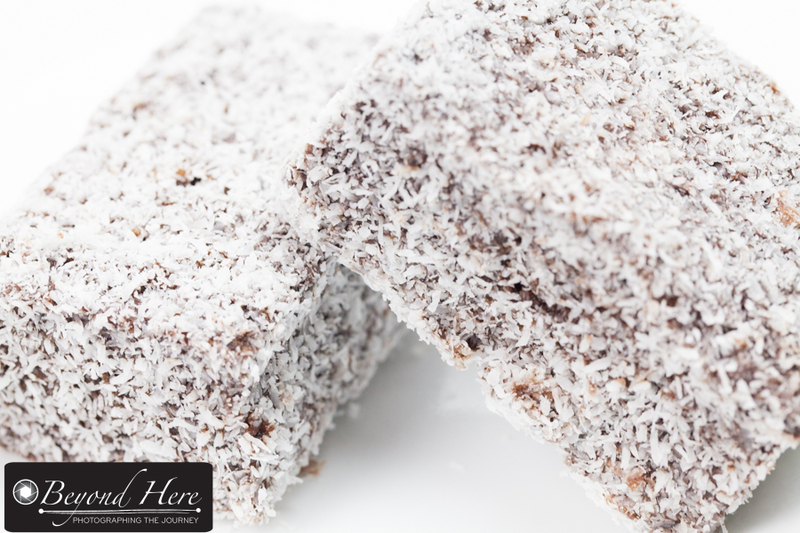 These shots were lit with 2 lights – one above the lamingtons and one to the side. It is a simple lighting structure and could be achieved using off camera flash and light from a window. In this case it was shot in my home studio using two continuous lights and soft boxes. (See this post for How To Build a Home Photography Studio). Any white background will work for these shots, and I had the subject on a white plate to catch any of the coconut when it fell off. Lens and type of shot. I used just one lens for this shoot, the Canon L series 100mm macro. With this lens it is possible to shoot extreme close ups, as well as shots which take in the whole of the subject. To create images which have the most flexibility for the buyer, I shot both vertical and horizontal, some with flags and some without, and others with a varying number of flags. Time commitment. This type of shoot is straightforward and doesn’t take long. I started by taking the lamingtons from the kitchen, and returned them after the shoot 25 minutes later. If you plan your lighting and background in advance, setting up, shooting, and wrapping up can be done in a very short period of time. Post production. I made small adjustments to the RAW images in Lightroom – increasing contrast, whitening the whites, increasing the saturation of the blue color, and cropping where necessary. Again this is a simple process and took about 2 minutes per image. The purpose of this post was to show you that it is not complicated or expensive to create simple stock photos using everyday items. Thanks for taking the time to read this post. Happy shooting. This entry was posted in Stock Photography and tagged microstock, microstock photography, stock photography, stock photography props on October 9, 2016 by Craig Dingle.